Since today is 1st March, I think it is necessary to dedicate a post to this special day in the Bulgarian ancient culture. 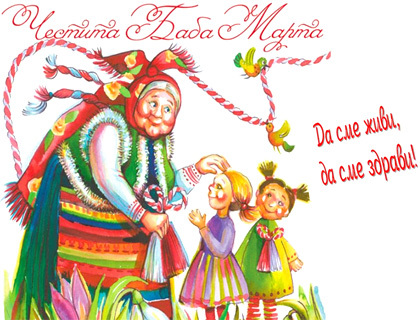 On 1st March, Bulgarians celebrate “Baba Marta” (meaning Grandma March), which is a welcoming custom of the upcoming spring. The tradition includes exchanging of “martenitsi” (plural) in the first days of March (especially on 1st). The martenitsa (singular) is the symbol of Baba Marta and is always in red and white. It could be in the shape of a bracelet (red and white thread twisted together), a brooch (the typical one represents two dolls of a boy and a girl made of red and white yarn, called Pizho and Penda) or a necklet. The white colour symbolises purity and prosperity and the red symbolises blood, passion and life in general (red and white are also two of the three colours on the Bulgarian flag- White, Green, Red). The two together are heralds of the spring and are believed to bring health to the one wearing them. That is why people exchange martenitsi with their family, friends and those they feel close to. 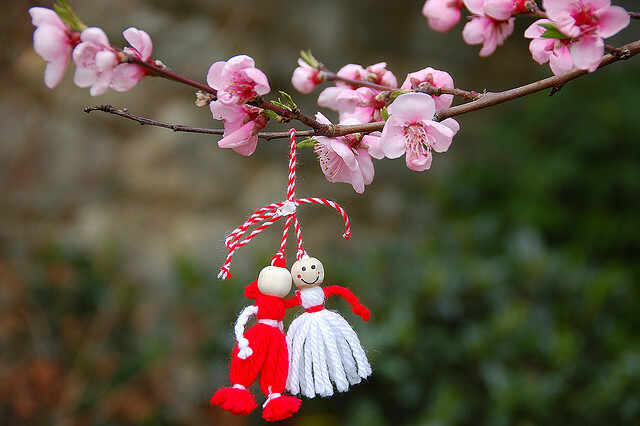 The martenitsa should be worn until one sees a stork or a swallow and then should tie it on a blossom tree. Since I was a child, Baba Marta has been one of my favourite traditions as I was waking with a martenitsa on my hand in the morning on 1st March. I was told that during the night Baba Marta came and tied martenitsa on my hand so that I am rosy and cheerful throughout the year. According to the belief, Baba Marta is an old woman who is very good and hardworking, but also short-tempered. This is why Bulgarians relate the changeable weather in March to her rapid mood swings. When it’s sunny and warm, Baba Marta is happy when it’s cold and unpleasant, Baba Marta is angry. Because of this, the month of March is also referred to as a ‘female month’. According to my observations though, Baba Marta is always happy on 1st March as it is always sunny and warm, just like today. The origin of the “martenitsa” tradition dates back to 681AD during the time of the Bulgarian Khan Asparuh. The Khan’s sister, Huba, had a prophetic dream related to the pagan god Tangra so she decided to send a falcon to her brother with a sprig of dill (traditionally used in the sacrificial pyre for Tangra) and a white thread tied to its leg. However, the falcon was hit by an arrow, which didn’t kill it but soaked part of the thread with blood, giving it a red and white colour. Despite the wound, the brave falcon reached the Khan who tied the thread to his hand. It is believed since then Bulgarians started wearing red and white threads, twisted together. During her 1300 years of existence, Bulgaria has shared lands with other countries, which is why some of them also hold on to the tradition (e.g. Greece, Romania, Macedonia etc. ).